Salvage experts have been transferred to a stricken factory fishing ship off Falmouth. They will assess the state of the Athena, which has been on fire since Wednesday. 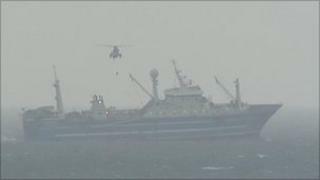 The fire, which started in a fish packaging area, has spread and the ship is listing from the weight of water from on-board sprinklers. Firefighters on the ship and all the crew have been evacuated amid concerns about the effect of toxic fumes. The ship has been held in position by a tug five miles east of Falmouth. The Faroes-registered Athena caught fire about 230 miles (370km) south west of the Isles of Scilly. A container ship rescued 98 of the 111-strong crew, who are being looked after the ship's agents in Falmouth. Cornwall Fire and Rescue Service personnel specially trained in dealing with marine fires were airlifted on to the Athena by helicopter earlier. The Athena was constructed in 1992 and rebuilt in China this year following another fire.